The produxct is sold in pairs with coluored red and black indicators. The plugs feature an all metal body with chrome plating along with gold plated contacts. 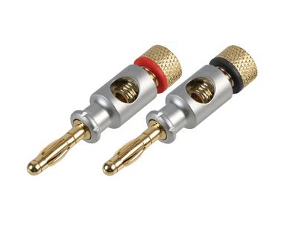 There is a cable entry hole of 6mm along with a screw down gold plated terminal for securing the speaker cable's in place. Banana plugs are used in conjuction with speaker wall plates and provide a perminant profeesional connection bewteen AV amplifiers and speakers. Looking for speaker connection plates to go with the banana plugs?